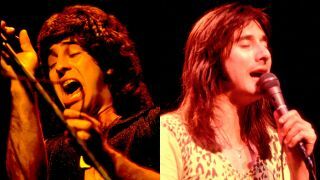 Journey’s transformation from jazz-rock noodlers into the hard rock behemoth behind Don’t Stop Believin’ coincided with the arrival of singer Steve Perry in 1977. But Perry wasn’t the band’s first lead singer. He was briefly preceded by Robert Fleischman earlier that year, recruited by Journey’s manager, Herbie Herbert, to give the largely faceless band more of an identity. But Fleischman still played a significant part in Journey’s – pardon the pun – evolution, co-writing future hit single Wheel In The Sky, a song that helped point the band in a bold new direction. After he parted ways with the band, Fleischman ended up singing on the first album by ex-Kiss guitarist Vinnie Vincent's band, the Vinnie Vincent Invasion before embarking on a solo career. He hasn’t been written out of Journey’s history, but he the part he played in their reinvention is often overlooked. Here, he shares his memories of his time in the band, and the part he played in laying the groundwork for his successor, Steve Perry. How did you join Journey? Were you made to feel welcome in the band? What do you remember about touring with Journey in 1977? What was the reception like from the fans at live shows? Did Neal Schon have specific ideas about what he wanted from you as a vocalist? What do you remember about writing Wheel In The Sky, which ended up on Journey’s 1978 album, Infinity? What was your relationship like with Journey’s manager Herbie Herbert? What ended your tenure in the band?